Contact Improvisation is a wonderful and expansive practice of connection with self and other. This series will deepen core skills for movement improvisation with others and expand movement potential. 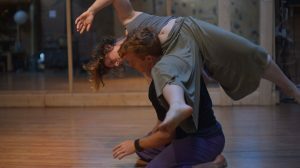 This 4 week all-levels series will deepen your presence with self, expand your movement options, engage and practice the improvisational mindset, and strengthen your toolbox for navigating connection within the dance (including initiating and ending dances, establishing boundaries, safety, etc.). This series will be taught by Julia Taylor and CJ O’Reilly. Please sign up for the newsletter on the Asheville Jam website to stay tuned for other CI series, classes, jams and events!